Review by Benjamin Mako Hill in Minds and Machines, Vol. 18, No. 2, June 2008, pp. 297–299. Review by David Berry in Theory, Culture & Society, Vol. 25, No. 7-8, 2008, pp. 364-372. 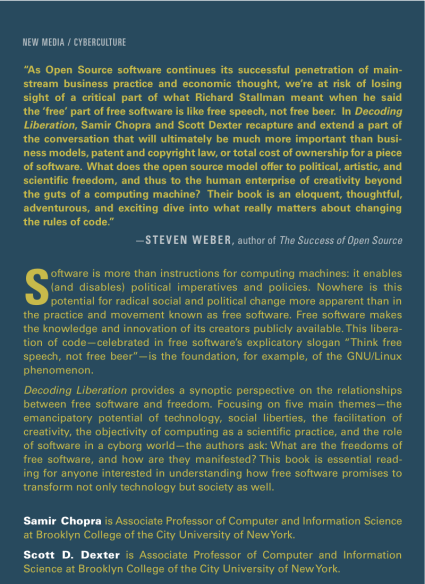 Samir Chopra’s Decoding Liberation: The Promise of Free and Open Source Software (Routledge) is an excellent and rigorous examination of some of the political and social issues around software and software development, strong on both the technical and philosophical front.